In this article we’ll see how to pass from the design of analog PID controllers for continuous-time systems to digital controllers, replacing operational amplifiers, resistors and capacitors with microcontrollers. Digital controllers are very compact, all the controller fits on a chip, including the A/D and the D/A converters, moreover, digital controllers are not affected by the aging of the components and don’t change their values with the temperature as analog components do. We’ll see how to apply the Z-transform, the equivalent of the Laplace transform, but for discrete-time systems, we’ll see how to identify the transfer function of a process and we’ll explain, with a step by step procedure, how to apply the theoretical knowledge learnt by examining an Proteus microcontroller based project, that uses its PWM output to control an oven ‘s temperature. The microcontroller has a 10 bit A/D converter. This procedure can be easily adapted with minimal adjustments to other processes to control. 2. Linear difference equations, Z-Transform, Inverse Z-Transform and Discrete Transfer Function. 4. D/A Digital to Analogic Converter and ZERO ORDER HOLD (ZOH) : Relationship between the Continuous Transfer Function and Discrete Transfer Function of a sampled Process. 6. Methods for designing Digital Controllers, Stability. 8. Transfer Function Identification and PID Tuning using the Ziegler–Nichols Method. 9. 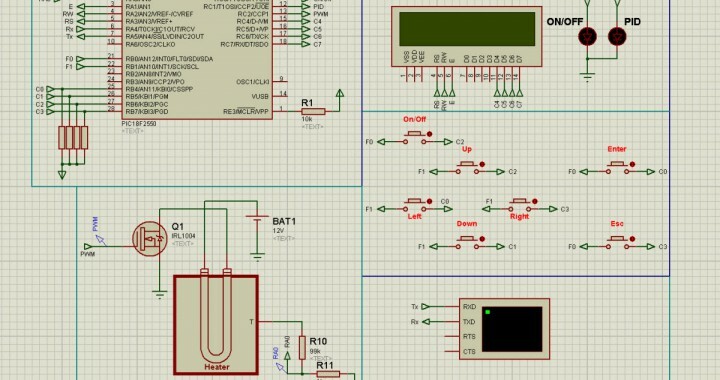 Practical case of a temperature control system implemented with a microcontroller PIC and simulated with ISIS Proteus: Step by step explanation of how to apply the theoretical knowledge for implementing and simulating a PID controller. Posted in Control Systems using SPICE and tagged controllers, designing, industrial controllers, microcontroller, PID, Proteus, spice simulation.